Social Anxiety Shyness is fairly common in the lives of many people, including me! There are, however, different degrees of it. It is not unusual for people to get nervous when they are in a situation where they feel they are “on display”. Social anxiety disorder, or social anxiety phobia, is different because of the degree of discomfort a person feels in those situations. Someone with social anxiety disorder will go to great lengths to avoid situations that make them feel that discomfort. They may dread a situation for great lengths of time before the event, and feel physical symptoms from it. I’ve noticed that if I make plans on going out one day, I will feel sick to my stomach until that appointment is over with. How do you deal with social anxiety? How can you conquer these feelings without being overcome by fear on a daily basis? For every negative thought, there is a positive one you can combat it with. When you are terror-stricken at the thought of something like speaking in front of a class, or going on a first date, irrational fears can leave you feeling overwhelmed. When those thoughts surface, replace them with positive thoughts about the same subject. If you are convinced you will mess up while speaking like I do, I always seem to stutter when I talk to someone new, or I stumble over my words. We can choose to entertain the thought that we may instead communicate effectively and even enjoy ourselves. When social anxiety is holding you back, fight back with force. Choose an activity you are afraid of and do it. You may feel scared at first but if you persist, the activity may eventually lose its terror in your mind. A large part of social anxiety is fear of the unknown, and you can’t fear the unknown once you know it. Another way to face your fears is to choose something greater than what you fear as your challenge. If you fear speaking in front of groups, speak in front of a large crowd. If you are afraid of accidentally making a fool of yourself, make a fool of yourself publicly on purpose in a dramatic way. By the time you are finished, your original fear often pales in comparison to what you have already overcome. Role playing can be effective in minimizing social anxiety. You can do it alone, but you can also find a good friend who is willing to assist you. Practice facing challenges that bring you stress, and work through the situation until it no longer feels like something you are as worried about. Role playing is another way to take the fear out of the unknown by making it known. Taking control of your breathing and using it as a point of focus can alleviate some social anxiety. 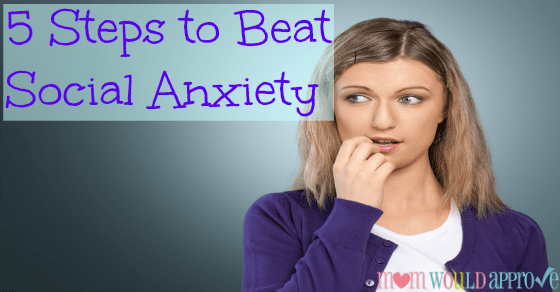 It gives you something to focus on rather than your fears and helps you to feel calm and centered, which are rare feelings when social anxiety is rearing its ugly head. Social anxiety can be aggravated by certain lifestyle factors. Take a look at those factors. Are you getting enough sleep? Are you eating a healthy, well-balanced diet? Take everything into account and make changes where necessary and see if any improvements are observed. Social anxiety is a common disorder, and at times, professional therapy and/or medication may be needed. There are simple steps, to help overcome social anxiety disorder. Try these suggestions and you may find that they are enough to give your social anxiety the boot after all.